The state of Oaxaca in Mexico covers a variety of terrains, reaching from the Pacific coast all the way up to the peaks of the extensive mountain ranges. This diverse landscape has helped to nourish and support a rich indigenous heritage that is evident from the moment you arrive. In total there are 3.8 million people in the state of Oaxaca, almost half of who identify as indigenous. There are officially 16 indigenous cultures in Oaxaca, but there is great diversity within this and a single language can vary greatly from one pueblo (village) to the next. Sadly Oaxaca is also one of the poorest states in Mexico, second only to Chiapas, and many people live without access to basic amenities like water, electricity or a decent education. The indigenous people of Oaxaca have often struggled to preserve their identity and to stand up to widespread repression (both state-sponsored and otherwise). This week in Oaxaca there is a gathering of indigenous people from around the state – the 2012 Cultural, Political and Revolutionary Meeting. Different indigenous groups from around Oaxaca are represented through song, dance, and rhetoric. I was fortunate enough a few days ago to see La Danza del Torro (the dance of the bull) from the coastal region. 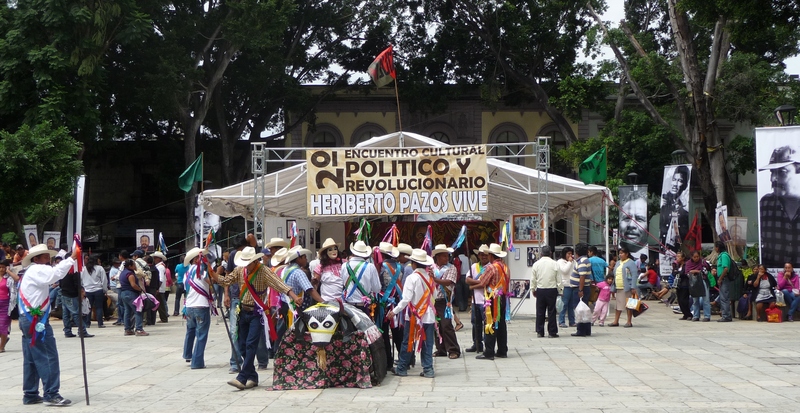 The whole gathering is being held in memory of an indigenous community leader Heriberto Pazos Ortiz, touted as a defender of Triqui rights although not actually Triqui himself. His image is emblazoned across banners throughout the zocalo (main square). 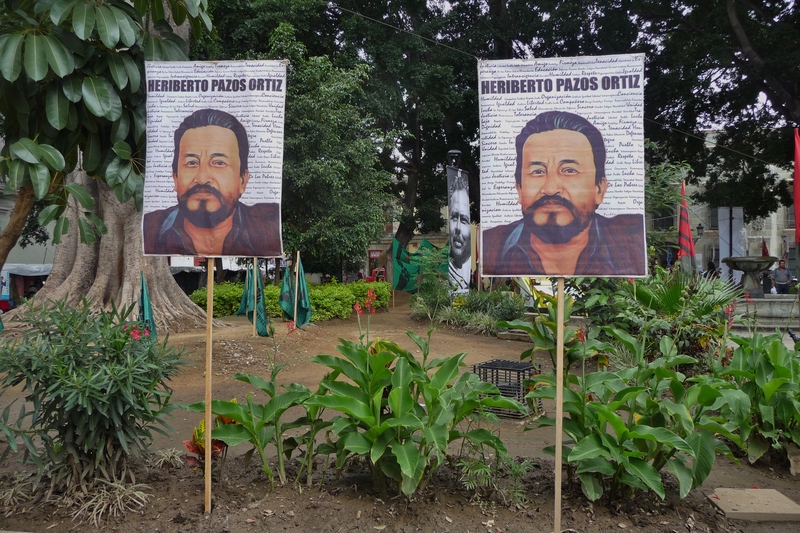 Heriberto was murdered almost two years ago, on 22 October 2010. On that morning Heriberto was riding in a black truck when he was gunned down by assailants on a motorcycle. It seems it was a targeted drive by shooting carried out by two young men, one a university student. There is speculation that the two men were likely hired hit men and both of them mysteriously died soon after the attack. Such targeted assassinations are not uncommon here in Mexico and Oaxaca has a long list of the fallen. I was intrigued to find out more about Heriberto Pazos – who is this man being celebrated? After a little digging, it turns out that the story of the Triqui people is actually more complicated than I imagined. The Triqui population lives in the mountainous Mixteca region of Oaxaca and is a small ethnic group that makes up a little over 1% of the indigenous population here in Oaxaca. Some 30 years ago Heriberto founded the Movement of Triqui Unification and Struggle (MULT, using the Spanish acronym). MULT started out as a grassroots organisation that fought for the rights of the Triqui people, but eventually took up arms and turned into a paramilitary group fighting for political power in the region against their rivals UBISORT – another Triqui group. Some have called this ongoing violence amongst the Triqui a civil war. Thousands of people have been displaced from the region by the violence and hundreds have been killed by the paramilitary groups. An example of this can be seen around mining – the Triqui region is rich in mineral wealth and many community members are opposed to mining due to environmental concerns. Part of the ongoing struggle has been around allowing mining concessions to continue in the region, with the paramilitary groups MULT and UBISORT working to further the state’s agenda. The government has also certainly done its part to exploit the division that exists within the communities to ensure the fighting continues. In the case of the Triqui, the dire situation they are in seems to be caused by direct links to an oppressive state by movements that once upon a time served their communities. The complex labyrinth of power dynamics manifests itself in oppression, disappearances and assassinations. Sadly these power plays threaten the very existence of the groups they are fighting for control over. tell me, who is interested in writing about an Indigenous person and what he has done for his community. on this webpage it just says little part of his life.